When the off-Broadway production Be More Chill announced that it’s coming to Broadway on September 5, theatre kids everywhere rejoiced. It should be no surprise that they took their excitement to social media, where the musical got its start. When Be More Chill opened in 2015, there was little fanfare surrounding the New Jersey based musical. Its original cast recording did not do much better. The show’s lyricist, Joe Iconis, thought that was the end. He moved on to writing other pieces, not thinking once about the show. For two years, there was not much activity. However, new fans started to notice the show in 2017, long after its New Jersey run had ended. But why? There was something about its unique premise that many high school students, I included, instantly latched on to. At its heart, Be More Chill is an endearing musical that brings the dramatic intersection of dark humor, hope, acceptance, and teenage angst to life. 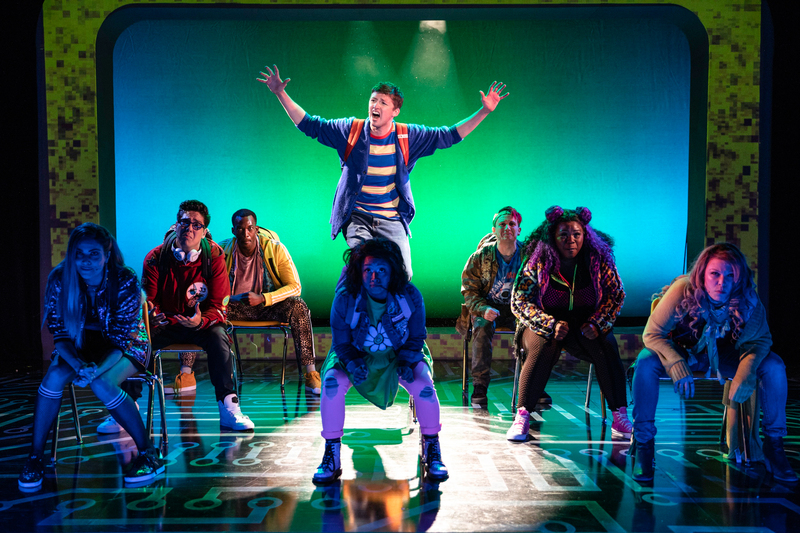 Based off of the book by Ned Vizzini (which shares the same name as the musical), Be More Chill embraces youthful social awkwardness in the form of Jeremy Heere, an anxious high school junior who struggles to fit in among his peers. His only friend is a boy named Michael, but even in their friendship, he feels inferior. He dreams to be one of the “popular” kids, a group made up of athletes and Pinkberry addicts, and to get the girl, a drama nerd named Christine. This is something all teenagers can understand. We’ve all felt like the world is against us, setting us up for failure. Social media consistently makes us feel never-ending FOMO. Real life scares us too- have you ever walked in the halls and imagined everyone’s eyes on you? Be More Chill understands our teenage anxiety the way few musicals can. Heathers is outdated; Dear Evan Hansen has had its run. Heck, Hamilton doesn’t focus on teenagers at all. We all can see a little bit of ourselves in Jeremy and his quest to be more chill. If we were in Jeremy’s shoes, this would be the end of our story. There’s nothing we can do to change the situation. It’s not like we have a universal handbook that can tell us how to be calm and well-liked. However, Jeremy soon receives something that even more valuable than a guide: a Squip. Part of Be More Chill’s charm derives from its penchant for the unique and unrealistic. Jeremy’s Squip, a supercomputer installed in his brain, shows him how to be popular. By completing small tasks like switching into an Eminem t-shirt and bigger ones like hooking up with Brooke, one of the popular kids, Jeremy suddenly has everything he’s dreamed of. While this may sound like a good thing, Be More Chill isn’t trying to teach us that popularity is key. Instead, the musical leaves us with the message that being yourself is what truly matters. In fact, Be More Chill shows us the downfalls of being popular. While chasing acceptance from his new social circle, Jeremy loses his best friend, his crush, and his single father. In the end, maybe that’s why theatre fans flocked to Be More Chill. Be More Chill presented the message we’ve always longed to hear: there is no better version of you than yourself. We may relate a little to Jeremy’s desire to be “popular,” but we all truly strive to be him at the end of the musical, when he’s happy being himself among the people who have loved him all along. This is a message we rarely see today. Social media encourages us to utilize appearance-altering apps like Facetune and VSCO. Advertisements of pretty models that look nothing like us only make us feel unworthy and inferior. We try so hard present our best selves so much that we lose our own identities in the process. The Be More Chill fandom, particularly active on Tumblr and Instagram, is a celebration of the self-acceptance the production preaches. Fans can be found dressing up as different characters, posting fan art, and writing fanfiction. It’s the loads of fan content that caught the attention of the original cast and crew. In fact, it’s the fans’ love for the show that brought it to the Pershing Square Signature Theater. Most of the original cast has returned too, though there are a few changes, the most notable being is that the wonderful Will Roland will be playing Jeremy. It only seems fitting that the same actors who originally brought these characters to life will be the ones to bring them to Broadway. Congratulations, Be More Chill. I can’t wait to see you at the Lyceum Theater next year.